With an eruption brewing, it may be the only way to prevent the extinction of the human race. 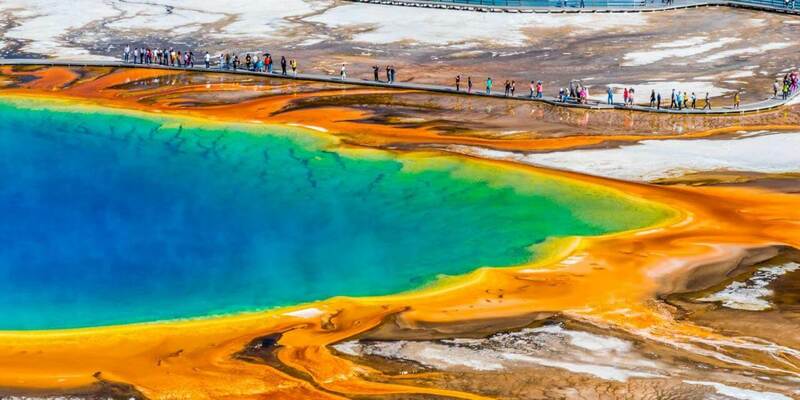 Lying beneath the tranquil settings of Yellowstone National Park in the US lies an enormous magma chamber. It’s responsible for the geysers and hot springs that define the area, but for scientists at Nasa, it’s also one of the greatest natural threats to human civilisation as we know it: a potential supervolcano. Following an article we published about supervolcanoes last month, a group of Nasa researchers got in touch to share a report previously unseen outside the space agency about the threat – and what could be done about it. There are around 20 known supervolcanoes on Earth, with major eruptions occurring on average once every 100,000 years. One of the greatest threats an eruption may pose is thought to be starvation, with a prolonged volcanic winter potentially prohibiting civilisation from having enough food for the current population. In 2012, the United Nations estimated that food reserves worldwide would last 74 days. When Nasa scientists came to consider the problem, they found that the most logical solution could simply be to cool a supervolcano down. A volcano the size of Yellowstone is essentially a gigantic heat generator, equivalent to six industrial power plants. Yellowstone currently leaks about 60-70% of the heat coming up from below into the atmosphere, via water which seeps into the magma chamber through cracks. The remainder builds up inside the magma, enabling it to dissolve more and more volatile gases and surrounding rocks. Once this heat reaches a certain threshold, then an explosive eruption is inevitable. But if more of the heat could be extracted, then the supervolcano would never erupt. Nasa estimates that if a 35% increase in heat transfer could be achieved from its magma chamber, Yellowstone would no longer pose a threat. The only question is how? One possibility is to simply increase the amount of water in the supervolcano. But from a practical perspective, it would likely be impossible to convince politicians to sanction such an initiative. Instead Nasa have conceived a very different plan. They believe the most viable solution could be to drill up to 10km down into the supervolcano, and pump down water at high pressure. The circulating water would return at a temperature of around 350C (662F), thus slowly day by day extracting heat from the volcano. And while such a project would come at an estimated cost of around $3.46bn (£2.69bn), it comes with an enticing catch which could convince politicians to make the investment. But drilling into a supervolcano does not come without certain risks. Namely triggering the eruption you’re intending to prevent. Instead, the idea is to drill in from the supervolcano from the lower sides, starting outside the boundaries of Yellowstone National Park, and extracting the heat from the underside of the magma chamber. “This way you’re preventing the heat coming up from below from ever reaching the top of the chamber which is where the real threat arises,” Wilcox says. However those who instigate such a project will never see it to completion, or even have an idea whether it might be successful within their lifetime. Cooling Yellowstone in this manner would happen at a rate of one metre a year, taking of the order of tens of thousands of years until just cold rock was left. Although Yellowstone’s magma chamber would not need to be frozen solid to reach the point where it no longer posed a threat, there would be no guarantee that the endeavour would ultimately be successful for at least hundreds and possibly thousands of years. But to prevent a catastrophe, such long-term thinking and planning may be the only choice. “With a project like this, you’d start the process and the main ongoing benefit you’d see in everyday terms is this new supply of electrical power,” Wilcox says. Such a plan could be potentially applied to every active supervolcano on the planet, and Nasa’s scientists are hoping that their blueprints will encourage more practical scientific discussion and debate for tackling the threat. How tall can we build and can we create a tower that goes into space?